Rescue under way for injured hiker on Mount Katahdin | Bangor Daily News. Appalachian Trail hikers stop before Mount Katahdin ascent | Bangor Daily News. Every so often I am reminded that I know some pretty talented people and some of them I’ve known a very long time. Kelly McInnis was a high school classmate of mine at Ashland Community High School, MSAD No. 32. It was a consolidated high school with students coming from several different area communities. Portage Lake, where I grew up, was one of those communities. Kelly, who still lives and works in The County, has a practiced eye when it comes to shooting photos. I seem to recall a photo of her from our high school yearbook, her red hair tied back and her wearing a baseball undershirt, the kind with the black three-quarter sleeves. In the photo, if I recall this correctly, she’s holding a 35-mm camera with which many of the other photos in the yearbook were shot. But that was … holy, cow, about 30 years ago, so my memory may have faded a bit. Sounds pretty plush for camping, but Kelly swears she roughed it by sleeping in a tent. 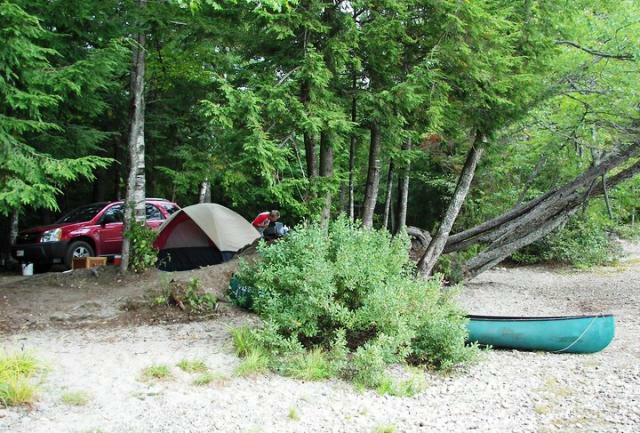 The campground is within the KI Jo-Mary Multiple Use Forest within 5 miles of the Appalachian Trial, with Baxter State Park and Mount Katahdin, the highest point in Maine, just 50 miles to the north. I don’t recall ever going to this campground, but I would now if I had a chance. It appears to be a wonderful spot. By the way, I believe Mount Katahdin is still considered the official northern terminus of the Appalachian Trail, even though as a youth I heard Mars Hill was considered by some to be the end of the trail, as it were. But earlier this summer I read a wire story about how a portion of the Appalachian Mountains actually may have been left behind on the European continent when the tectonic plates shifted. 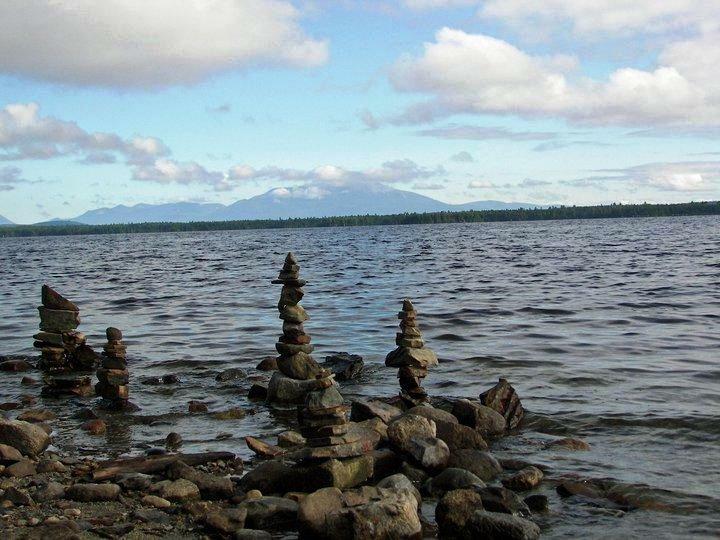 Anyway, a couple of Kelly’s photos show Mount Katahdin in the background. Kelly didn’t know what the piled rocks were in some of the photos. Perhaps they are the product of a bored pack of children? Perhaps something more natural and mystical, such as the work of local native people? Perhaps something more mysterious still, such as the work of aliens from another planet? 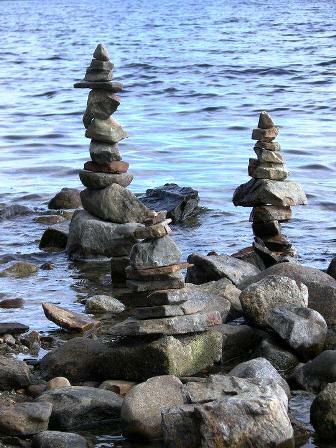 I think I’ll just call them the Ancient Rock Towers of Maine’s North Woods. I’m sure that will start showing up in search engines any day now. Another photo appears to be shot at the edge of a stream or other water source and shows the beginning of foliage changing. It has been a rather dry summer in Maine and some of the leaves are changing sooner than they normally would, as documented by Kelly’s photos and, well, my Mom. She said the same thing when I called her Sunday. 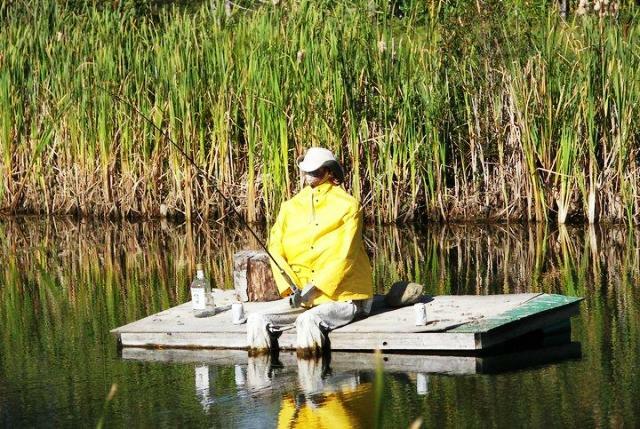 And there is a whimsical shot of a dedicated Maine fisherman. These photos were printed with Kelly’s permission. When Maine’s state park system was created by the legislature in 1935, it consisted of a single area of land. Since then, it has grown to more than forty diverse properties, from ocean and lake beaches to picnic areas and campgrounds to trail-laced mountains and lush forests. To celebrate the state parks’ seventy-fifth anniversary and to guide you to the place that suits your mood, here’s a play list — play as in walk, boat, swim, and splash. These suggestions are somewhat whimsical. Most parks are, after all, destinations for many different kinds of activities, not just the ones highlighted here. Find out more about an individual park’s natural features and facilities at the Maine Department of Conservation’s Bureau of Parks and Lands Web site, www.maine.gov/doc/parks, or call the bureau at 207-287-3821 and ask for a brochure. Click for the rest of this piece by Virginia Wright in Down East Magazine. Rescued hiker not liable for search costs – Bangor Daily News. Update: Searchers for missing hiker spot tracks | The Portland Press Herald / Maine Sunday Telegram. FORT KENT, Maine — There is little chance the forests and wild lands of northern Maine can ever be returned to their pristine state, but a group of conservationists sees no reason they can’t be at least partially restored and protected for generations to come. RESTORE: The North Woods has advocated the formation of a multimillion-acre park or preserve in north central Maine since 1994, and on Friday the group’s director discussed the plan with students, faculty and guests at the University of Maine at Fort Kent. The area in question has long been the center of timber and logging operations in Maine going back to the early to mid-1800s when lumber from the great northern forest produced enough raw material to help Bangor become the lumber capital of the world. Click in the link for the rest of today’s story by Julia Bayly in the Bangor Daily News. In recent years Maine has tripled the amount of land set aside for conservattion. I really, really like the idea of protecting the land from development. That said, there are some very interesting points raised in the comments section of the online story, mostly about accessibility and the loss of tax revenue. But protecting lands could mean new jobs in outdoor recreation, environmental education, etc. 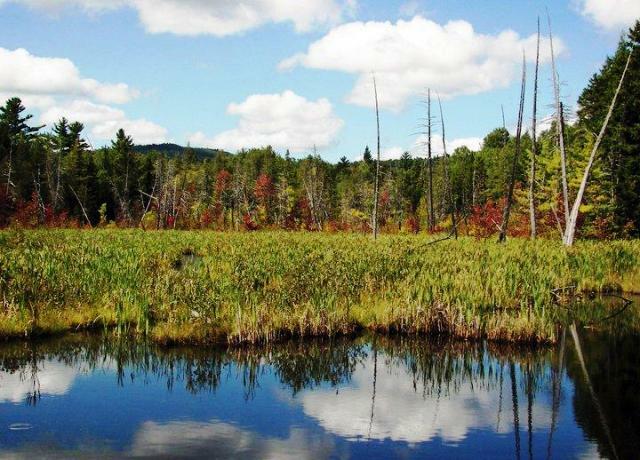 Outdoors enthusiasts delight in state’s conservation efforts – Bangor Daily News. There are several mentions in this story about how large paper and timber mills used to own much of the land and that those companies allowed access for recreational uses, including hunting, fishing and snowmobiling. I recall as a child stopping at a gate in the woods to be let onto those lands. Going through the gates meant being able to enjoy the outdoors. Oh, and here’s a link to a Maine Public Broadcasting Network story about the acting state conservation commissioner offering to help the state close its budge gap. One of the things to be cut — a helicopter. And, according to the story, there’s already an offer for the helo. Here’s the latest from DownEast.com’s trivia selection. I’m not sure “treehugger” is PC any longer, but what the heck. It is Maine, after all. Who was Maine’s first treehugger? Gov. Percival Baxter, who was considered something of a radical in the 1920s when he proposed a public park surrounding and protecting Mount Katahdin. Rejected by the legislature, Baxter used his own money to create his “forever wild” reserve. 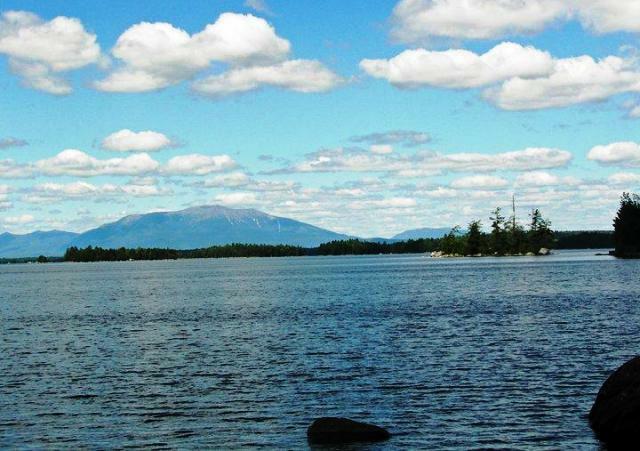 Today more than 60,000 people each year visit the two hundred thousand-acre Baxter State Park to enjoy the stunning beauty that his vision first recognized. Mount Katahdin is the official northern tip of the Appalachian Trail, although some believe it actually goes to Mars Hill, Maine. My family went camping in Baxter State Park when The Sis and I were young. It was a fantastic adventure — hiking, skipping stones on water, watching the black bears wander into the park’s garbage dump for evening chow. As I recall, we may have stopped off at the Lumbermen’s Museum in Patten during the same trip.